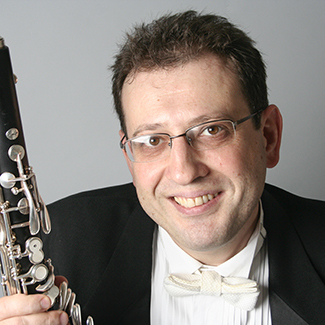 Clinic Synopsis: Mr. Potiomkin will present a methodical approach to audition preparation that he has cultivated through his professional experience as a clarinetist, and implemented with his high school students to achieve success at all-state and college auditions. Clinician Biographical Information Sasha Potiomkin has been appointed by Maestro Hans Graf as a bass clarinetist and a clarinetist with the Houston Symphony in 2012, holding a Tassie and Constantine S. Nicandros endowed chair. Much in demand as an orchestral musician, Sasha has performed as a guest artist with The Cleveland Orchestra ( including the 2016 European Tour), The New York Philharmonic, The Saint Louis Symphony, The Chicago Symphony, The Israel Philharmonic and as a guest Principal Clarinetist with The Kansas City Symphony and Alabama Symphony ( including ASO Carnegie Hall performance in 2012). As a soloist, Sasha has given recitals in his native Ukraine, Israel and throughout the United States. He has also appeared as a soloist with the Tel Aviv Symphony, the Israel Camerata, the Brooklyn Philharmonic, the Houston Chamber Orchestra, and Orchestra X Houston, under the direction of Itay Talgam, Lucas Foss, and John Axelrod. The most recent performances were the World Premieres of "Twitch" by Nathan Daughtrey for solo clarinet and wind ensemble at the 2016 Midwest Clinic in Chicago, and " The Nail" by Robert Smith for clarinet, piano and bass trombone, performed at the 2017 Texas Music Festival. As a dedicated teacher, Sasha has influenced hundreds of young clarinetists in Texas, and around the United States. He has given master classes at Rice University, the University of Houston, the University of Florida, and the Buffet Group Showroom in New York City. He was also invited by the current HSO Music Director, Andrés Orosco-Estrada, to teach a week residency with the Colombian Youth Orchestra in Santa Marta, Colombia. He has participated in the Tanglewood, Blossom, and Bellingham Music festivals. His main teachers were David Weber and David Peck. He has also continued additional studies with Yehuda Gilad, Mark Nuccio and Michael Wayne. Sasha is a Buffet Group and D'Addario artist and clinician.